If you’ve been playing along at home, you already know Mikey’s boy Trent is a soccer star and recently discovered savant. What you don’t know is that he went and did what every kid always does… he got sick. That’s how it came to pass that the baton would fall to me to post this fine evening. Lucky for me I skipped lunch. I’ve been wanting to go to this place for a long time, but just haven’t had the opportunity. Well, that all changed tonight. Since Yolanda’s is right on my way to the skating rink (yeah, i’m a nerd like that) I figured I just couldn’t pass it up. The first thing I noticed was that this place was huge. I know it looks tall from the photo I took, but that isn’t the half of it. They have a decent sized bar, big patio and two huge banquet hall sized dining rooms. I think the only place that’s bigger is Los Toros, but that’s because they just kept annexing territory in their own attempt at manifest mexican food destiny. The next thing I noticed was that nobody made an effort to seat me. In fact, I think the manager only said anything to me because I had just muttered a pretty audible WTF, and was beginning to look angry. Anyway, I pulled up a seat at the bar just in time to watch the end of the bulls/celtics game and was greeted with some fresh chips and salsa. All was forgiven. Guess what? They brought bean dip with their chips just like Los Toros. Is this starting to catch on? Or are all the mexican food places I used to go to just super cheap? Either way, the combo of warm chips, cold salsa and the bean dip were an awesome way to ease into the meal. I ended up ordering the Quesadilla Tacos, which is basically just a taco without lettuce that has been pan fried like a quesadilla. It was one of the specials that they run on Monday and Tuesday due to the bad economy. Of course, I upgraded the meat to shrimp and completely blew any savings I might have had. The bartender also brought me out a cup of the Albondigas soup which was very good. The broth was spicy enough and the veggies came in large chunks. The meatball, which I did eat, was a good size and not too dry. Next thing I knew, my meal was in front of me. I had gone to the salsa bar in advance to grab a couple salsas for my meal. They’ve got about 8 different salsas to use, but I stuck to the Habenero, Chipotle, and Yolanda’s house salsa. Here’s what my Quesadilla Tacos looked like, minus the bite that I took before the picture. At this point, I had already consumed more calories in chips, salsa and soup than I had eaten all day. So the prospect of a full meal was not such a pleasant one for me at this point. However, I was quickly surprised at how flavorful the shrimp were. They were pretty good on their own, but combined with the spicy habenero salsa they were great. As far as the rest of the components, the tortilla was a little heavy and greasy, but in small doses tasted alright. The beans and rice were average, with the beans being the better of the two. The rice actually didn’t taste like anything. It was remarkably close to eating air and I ended up leaving most of it on the plate. Ultimately, it was the salsa that was the best aspect of the meal. The habenero was spicy but not so much that you couldn’t taste the flavor. The chipotle was very smoky with a vinegary finish and Yolanda’s own salsa was probably the best tasting of them all. It was what you would expect from a signature salsa. All the flavors were covered with none that overwhelmed. I liked this place and I think I would go back. But I would probably bring a group with me. This is a cool place to hang out with a bunch of people and drink margaritas while unwinding on a Friday after work. I like that they have the specials for Monday and Tuesday, but really they’re only a ploy to get more people in to drink. 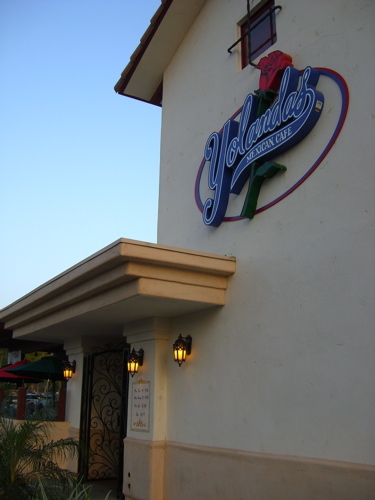 The last thing I’ll say is that Yolanda’s is still pretty new, so it’s a really “nice” place. If you’re gonna go, go soon. It’s only a matter of time before Simi sinks in and the place loses its luster. Hopefully I’m wrong about that, but I’ve seen it time and time again. So let the buyer beware. Ever been to Los Dos Amigos? It’s muy bueno and they do the bean thing with the chips and salsa. Their food is pretty authentic and they do a lot of seafood. If you go, you gotta get their melon (Midori) margarita…they do it really well. Ohhh, I LOVE Los Dos Amigos. I love, love, love their Tortas. And their bean dip is sooooooo yummy. Did I convey the yumminess there? Also, the people are cool. One time, out of the blue (I was pregnant so it may have been a nice gesture for the ginormous chick) they came out with a huge platter of appetizers for us to try. For free. That was AWESOME. I know, this isn’t a review for Los Dos Amigos…Yolanda’s sounds cool too. I know a bunch of peeps that swear by los dos. However, both times I went, I left with a bit of an upset tummy. Just being honest. Im guessing you ate at Yo-lawn-duhs? I worked in Simi Valley as a Paramedic for what seemed an eternity and I would give it two thumbs down but I think its already one of there main ingredients. Ya know what? I wasn’t 100% sold on the quesadilla tacos. However, the chips and diverse salsa selection is a big plus in my book. As is cleanliness. 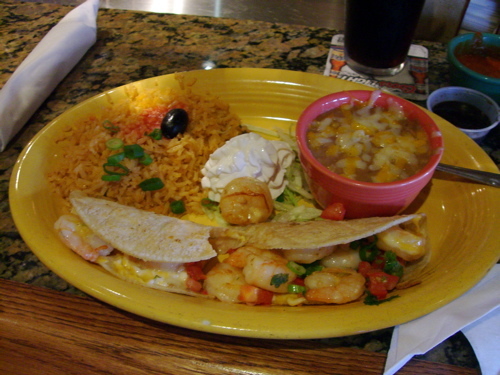 A great place that I go to all the time that would be cool for you guys to review is Lupes Mexican Restaurant in Thousand Oaks. It’s the oldest restaurant in TO i believe, they home make everything including the best chips and salsa I’ve ever had that they bring out in unlimited quantities. If you’ve never been, I highly recommend it.